The Southern Regional Research Centre was established in 1965 in sub-temperate region at Mannavanur in Tamil Nadu located 35 Km ahead of Kodaikanal (Tamil Nadu). 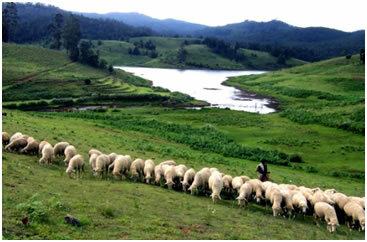 The centre has an area of 1346.88 acres, comprising of 545.38 acres revenue land and 801.50 acres of forest land. This centre is situated at an elevation of 2030 meters above mean sea level and located at 10° 13' 30.1908" N (10.225053 ° N) latitude and 77° 20' 40.725" E (77.344646 °E) longitude. The average annual rainfall is 1055 mm, well spread throughout the year. The mean monthly ambient temperature from April to June is 25°C. Maximum temperature ranges from 26°C to 30°C and the minimum temperature ranges from -3°C to 5°C. Relative humidity varies from 15 to 90%. During the year 1997, Government of Tamil Nadu withdrawn 400 acres of revenue land and Forest department 801.5 acres of forest land and the centre is working on remaining 145.38 acres of revenue land. An elite flock of Bharat Merino sheep suitable to cold climate has been established at the station. Bharat Merino sheep are well in demand in southern states for improving mutton and wool.